Water has always presented a special challenge for artists. It has no consistent shape or color. It does not reflect light or cast shadows the way solid objects do. 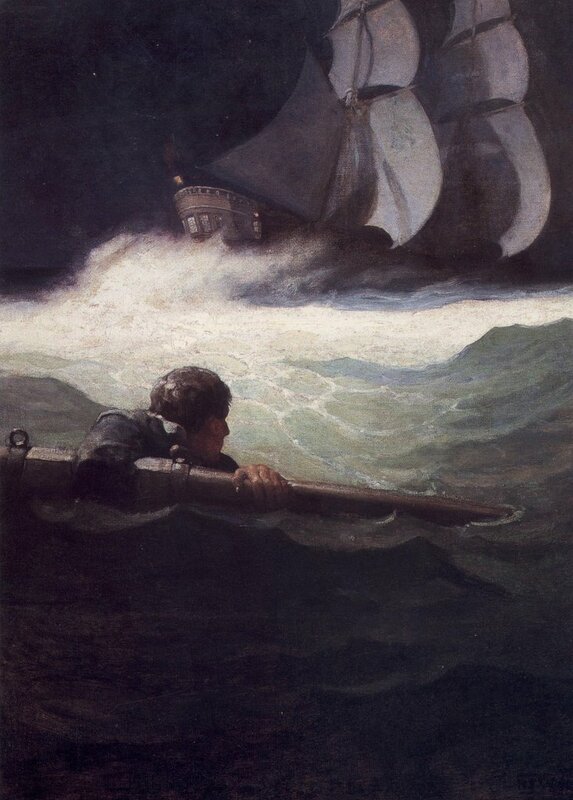 In the picture above of a shipwreck and the following picture of a placid river, illustrator N.C. Wyeth captures two very different examples of water's temperament. Strikingly different methods of depicting water have also been adopted by animators (ranging from Pinocchio and Fantasia to the Incredibles) and by Japanese woodblock artists such as Hokusai. I would be interested in input from readers on additional artists and approaches. Underwater it is somewhat as if Tiepolo were doing free floating and flying mythologies in the water instead of in the air and illuminated them with focused sheets and bands of strobe lights. That is what makes it so interesting for me to dive. I will devote my next posting to some of Meltzoff's insights. Wow! What a fascinating topic, David. The thought of seeing someone actually painting underwater, as you describe Meltzoff doing is... surreal! Since you've invited your readers to contribute other artists of interest who have interpretted water in their own unique way, may I suggest this piece by Al Parker, as well as this one which I think its safe to say was a not very successful attempt at photo collage of a sort. And finally, I'm quite fond of this forbidding piece by CE Monroe Jr. The animation of water in Miyazaki's Porco Rosso was tops IMHO. 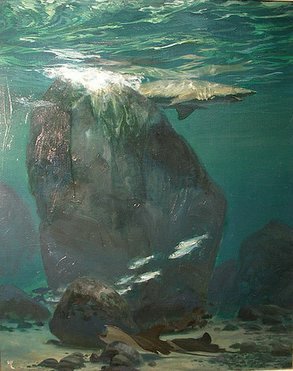 Leif, if you want to see a photograph of Meltzoff painting underwater, you can find it at www.stanleymeltzoff.com. I would have thought such an approach was a little extreme, but I can't argue with results. His paintings really take you there in a way that few others do. Anonymous, I have not seen Porco Rosso but I know there is a book about the art from the film and I will check it out. Great post. The Meltzoff paintings are really wild. Enjoyed the Wyeth, his painting of reflections makes Parrish look like crap by comparison. Meltzoff's art is cool. What else did he do? This is a fabulously inspiring blog David, you're definately a man after my own heart! Very happy to have stumbled across the jewels you display. Craig / Anonymous, I just tracked down your Backhuysen painting and it is a doozy! I can understand why those swirling waves would leave a permanent imprint on a young mind. I also love the work of Turner and of Aylward, a maritime illustrator from late 19th century. Glad you're a Ditko fan too! John / Anonymous, so happy there is another kindred spirit out there. Thanks for your comment, it means a lot! Catherine/anonymous, the topic of underwater scenes came up recently when my young daughter and I painted a mural of a Caribbean coral reef on her bedroom wall. She picked the subject and-- while the result doesn't look anything like Mr. Meltzoff's paintings-- she seems to like the result. 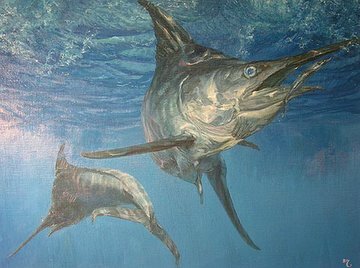 Wonderful undersea paintings, they really encapsulate the scuba experience (something I've not done for quite a few years)... and such wonderful use of light. Thanks for the Rackham images, John, I enjoyed them. 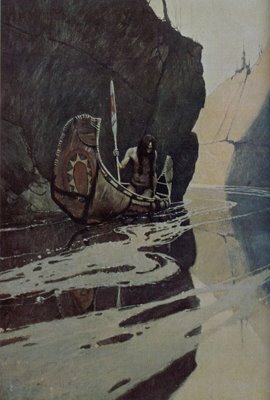 Edmund Dulac also had some excellent water scenes from around this time. This site is dedicated to the dissemination of all available information regarding arts site. 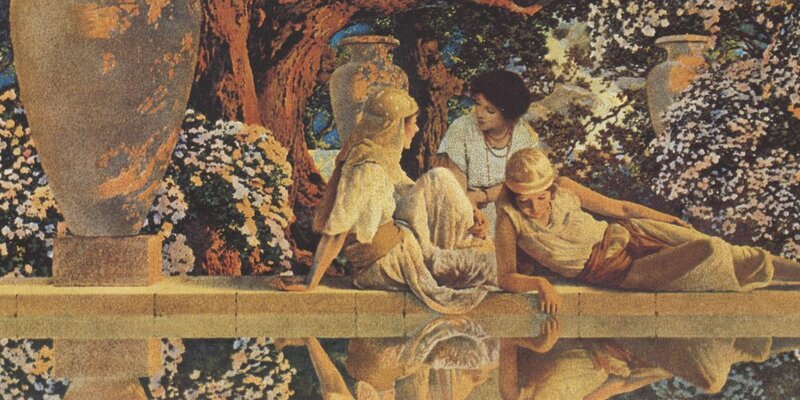 May I suggest spanish painter Joaquin Sorolla? Some examples of his water painting skills. 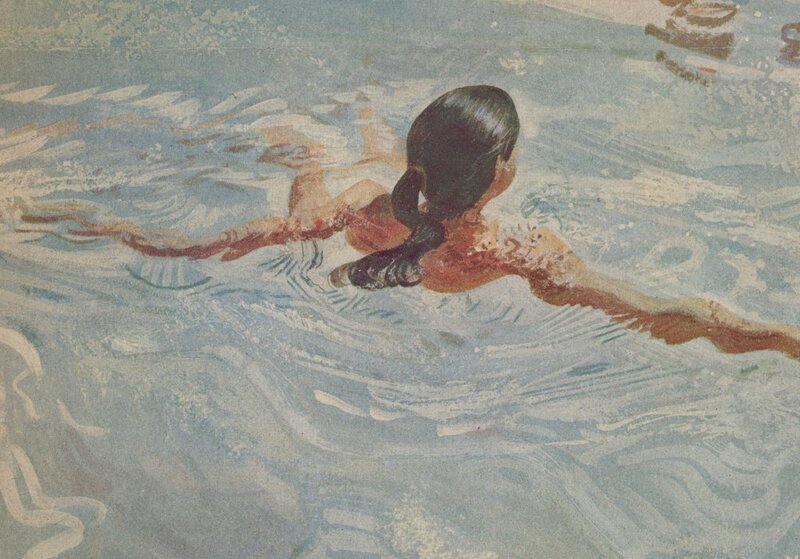 i'm a few years late to join this discussion but i would like to add david hockney as an incredible painter of water. 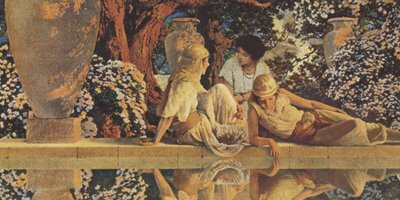 he did many paintings of swimming pools and represented water in a variety of methods and styles- definitely worth checking out!